We Care.... Come See the Difference! 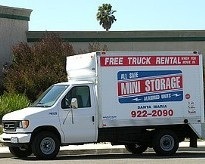 All Safe Mini Storage offers storage space to both commercial and residential customers at the best rates in town! Records - Don't waste your valuable office space storing old boxes of records. Equipment - If you have equipment not in use, store it with All Safe! Samples - Don't let boxes of samples stack up in your office. Store them with All Safe. Marketing Materials - Just like those boxes of samples, marketing flyers can take up valuable office space. We accept deliveries on you behalf from UPS, FedEx, and more! All storage units located at ground level - No elevators, no stairs. Free Use of Rental Van on Move-In!